Petaling Jaya, Malaysia -- Tsem Tulku Rinpoche adopts a modern teaching style to spread the word on an age-old way of life. LIKE many teenagers, Tsem Tulku Rinpoche went to discos, worked at McDonald’s and listened to Madonna. << Meeting the people: Tsem Tulku Rinpoche applies his own experiences and interests, including pop music, in spreading the Dharma. His childhood wasn’t all fun though: to get away from an abusive stepmother, he ran away from home several times, slept on the streets and even begged for food. One time, he hitch-hiked from New Jersey to New York and finally to Los Angeles – penniless and homeless – where he found his first job at McDonald’s. Rinpoche’s early days bore all the hallmarks of an adventurous kid who simply wanted to live life to the fullest. However, this was no ordinary American youngster. Now 44, he was born in Asia to a Tibetan father and a Mongolian princess from Genghis Khan’s lineage, and was sent to live with a foster family in the United States at the age of seven. There, he developed a passion for the Dharma. Ironically, it was his foster parents’ restrictions against practising the teachings of the Buddha that drove him to leave home. It was also probably what sparked Rinpoche’s life-long holy journey in bringing over 2,500 years of the Dharma to the modern spiritual seeker. Today, he is recognised as the incarnation of Ken Rinpoche Gedun Nyentrak, the 72nd abbot of the Gaden Shartse Monastery in India. Yet, for all the grandeur and reverence as a reincarnated lama, Rinpoche comes across as a simple, fun-loving guru known for his largely unconventional teaching methods. His unique ability in bridging the East and the West, disco and dharma, tantra and the 21st century, has drawn both compliments and criticisms alike. 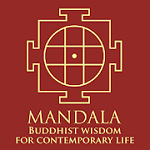 Indeed, Rinpoche’s progressive teaching style includes elements as diverse as Madonna’s music, sacred sutras, feeding the homeless and caring for animals, to convey authentic Buddhist teachings. “I love Madonna’s music. She has been my favourite pop star since I was a teenager, before my ordination in the United States,” Rinpoche tells StarTwo in an exclusive interview. He recalls that he was being driven in Los Angeles, with a friend, when he first heard one of her songs and was drawn to it. “My wish has always been to meet Madonna one day and offer her a Buddhist gift,” he says, adding that he hopes to have a spiritual exchange with her. Rinpoche, however, says he does not wish to become a “designer guru” who tailors his teachings to suit the jet set with limited time. The interview was held in conjunction with the global launch of Rinpoche’sbook, Gurus for Hire, Enlightenment for Sale (Revised Edition), at the London Book Fair recently. The latest book is also in response to the increasing numbers of designer gurus and quick fixes for enlightenment in the wake of the global economic downturn. The teacher is founder and spiritual guide of Kechara Buddhist Organisation in Malaysia (www.kechara.com) whose group of entities continue to uphold the teachings and pure lineage of Lama Tsongkhapa (1357-1419), one of the most important figures in Buddhism. Elaborating on his unconventional style, Rinpoche says he needs to juggle his life in the East and the West with what is appropriate and beneficial for others. “I have to draw upon my experience with discos and within the Dharma and also the ancient teachings such as tantra and make it all relevant for the 21st century,” he explains. He believes such teaching methods will be effective as they are based on something that is sacred, time-tested and proven but in a modern sphere using modern examples and speaking a modern language. Rinpoche says while Buddhist teachings can be used to solve immediate, mundane problems and provide remedial relief for a certain state of mind or unhappiness, there is no “quick fix for enlightenment”. “Transforming and changing our mind and attitude would take years to renew, restructure and rethink,” he adds. Rinpoche admits that, being in the public eye, he has to deal with malicious rumours such as him being disrobed, using supernatural powers and being expelled from his monastery. “Wearing a robe and not wearing a robe does not make you disrobe. It’s you holding your vows, and I am holding my vows,” he says. 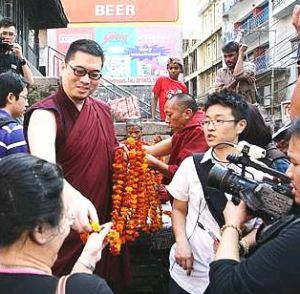 Rinpoche says he has not been expelled from the monastery, adding that he enjoys a great relationship with his abbots who like what he is doing. “They have sent very wonderful letters praising and encouraging my work, which is a blessing,” he says. (The letters can be viewed on www.tsemtulku.com). He explains that keeping his hair and wearing lay clothes makes it easier to spread Dharma teachings to certain people. He is unperturbed by rumours and negative talk, which is typical with an unconventional teacher like himself. In speaking about his relationship with his stepmother, Rinpoche describes her as warm and generous when not affected by schizophrenia, but turning abusive towards him when she was unwell. He, however, says he has forgiven her because “that was not her speaking or acting”. Rinpoche hopes his first book, published in 2007, has contributed to the growth of Dharma centres and that the latest edition will achieve similar objectives and touch more lives. Ultimately, Rinpoche aspires to create an institution in which people would put into practice Buddha’s teachings to improve their lives. This, however, does not mean they have to become Buddhists. “The centre must be a place that can transform people’s minds to see things on a wider and more accepting, tolerant plane of perception,” he says. On an inner level, Rinpoche hopes to develop complete forgiveness towards any harm done to him, as well as great compassion, love and extreme tolerance for others. 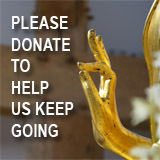 Rinpoche wants to be remembered as a person who developed genuine, no-agenda compassion. DHARMA and glamour may seem worlds apart but as far as Bill Keith is concerned, both can go hand-in-hand without compromise. The Malaysian fashion designer says that Dharma works with anyone anywhere as long as one understands it and applies it in one’s daily life. For him, there is no need to give up his fashion career for spirituality. “It’s all about body, speech and mind – your attitude at work, how your children react or how you communicate with your family,” Keith says during a party to celebrate the global launch of Tsem Tulku Rinpoche’s Gurus for Hire, Enlightenment for Sale (Revised Edition) at the London Book Fair recently. “That’s what I’m doing now, planting little seeds in my clients as Rinpoche had done for me,” he says, although he makes it clear that he would never tell his clients, who come from all walks of life, that they have to pray or go to a cave to meditate. Kechara Media & Publications, the publisher of Rinpoche’s books in English, was represented in London by 10 of its executives. Keith, the creative arts director of Kechara House in Petaling Jaya which was founded by Rinpoche in 2000, adds that the teacher encouraged his students to be spiritual on the inside while being who they were on the outside. According to him, other celebrities who support Kechara Soup Kitchen, one of Kechara House’s outfits, include Eric Choong, Anita Sarawak, Ning Baizura, Norin Aziz and Soong Ai Ling. “We get support from all sections of society as we help everyone irrespective of colour, creed or religion,” he says, of the soup kitchen (www.kskcommunity.org) which distributes food to the homeless and poor. Malaysian celebrity shoe designer Datuk Jimmy Choo, who was also at the book launch, says he hopes to meet Rinpoche one day. “I am a spiritual person and believe in Buddhism. It would be great to meet Rinpoche and talk about Buddhist teachings,” he says. Gurus for Hire, Enlightenment for Sale (Revised Edition) is available at Kechara Mystical Treasures at 24, Jalan Telawi 2, Bangsar, KL; Dzambala Mystical Treasures at 1-Utama, PJ; and Yogini Mystical Treasures at Lot 10, KL, and major bookstores.